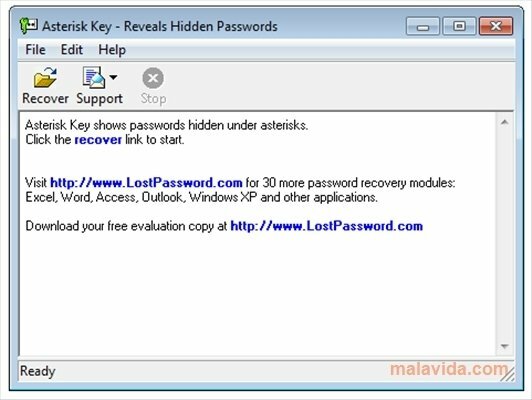 Asterisk Key is a software application to find out hidden passwords. Finding out your Yahoo! or Messenger password if you have forgotten it will be as easy as seeing the asterisks and launching Asterisk Key. This software will scan the memory and will decrypt the asterisks to indicate the hidden password. It isn't strange for the majority of users to allow the browser or any program to automatically remember their usernames and passwords and forget them shortly after. This isn't always recommendable because many users soon forget the password and have to resort to programs like Asterisk Key to show the hidden passwords. When you download Asterisk Key for free, you will have access to the Messenger passwords that you have stored in the program itself, it will also be possible to know your Facebook or Yahoo! Account as long as you have the browser's remember password option activated. Of course, it is capable of working on Word files, files compressed with a password and all kinds of authentication systems. Asterisk Key's interface is very austere, showing only a text zone in which you will see the passwords it has found and some other data.